Speed bumps are great at reducing the speed and controlling the flow of traffic. So now you’ve bought some where are the best places to put them, and how do you install them? The installation of a speed bump is designed to reduce traffic down to between 0-5mph and reduce the risk of accidents in vulnerable spots. The majority of drivers stop before they gently take their vehicle over the bump or at the very least slow right down before continuing over it. With this in mind it’s not advisable to install these where the traffic needs to flow freely as it can cause queues which will irritate drivers. However if you have a stop sign which is being ignored i.e. in front of a shop where pedestrians are crossing from the car park, then this a perfect solution as the vehicles will have slowed down significantly before they get to the stop sign. Another good place for these will be around the car park itself, this will stop cars driving too quickly and potentially clipping cars that are reversing out. These types of scenarios are exactly what speed bumps are for. 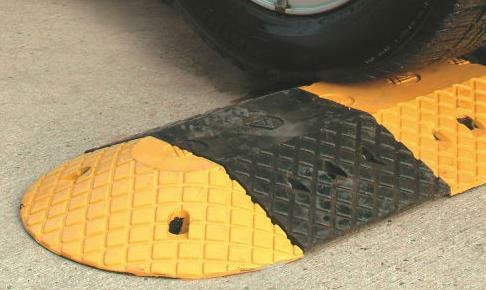 Installing your speed bumps should be quick and easy and if you want to relocate them in the future you can! Before you start installing the speed bumps, please make sure that you have put up adequate warning signs of work going ahead and make sure that you are not in a dangerous position. Congratulations, you have just installed your speed bump! And you have raised the safety standards in your area as well.